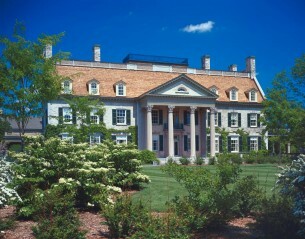 Somewhere between New York City and the Niagara waterfalls lays the estate of Kodak founder George Eastman. Opened in 1949 in the town of Rochester, NY the Eastman house is a truly beautiful estate, with large trees and gardens as part of the premises. When entering the main hall you’ll see a timeline of the history and evolution of photography from 5th century B.C. (Mo-Ti makes the first known record of the camera obscura) all the way through to 2011 (500 billion photos on Facebook). The camera history is mixed with important historical facts, like: 1848: California gold rush begins or 2011: Steve Jobs dies. This works really well because it helps you to put the technical developments in perspective with historical events. In the first gallery near the entrance you will find a very large Camera Obscura, you can even go inside the camera and take an upside down look at the vase with flowers it is pointing at. This charming small exhibition (till April 28) also hosts all kinds of unique (wo)man made pinhole camera’s that makes you want to fabricate one yourself. The Ag (silver) & H2O (water) exhibition by Lauren Bon is on display till May 26. For this exhibit Bon followed the silver route through America. Silver mined in California was shipped over to New York state where the Kodak company used it to produce film that would be shipped back to California to be used in the early days of the upcoming movie industry. Hence the word: Silver screen. The idea is beautiful and intertwines easily with the historic, avant-garde and contemporary importance of the Eastman House. Bon – together with her Metabolic Studio Optics division – used a very large Liminal Camera (a pinhole camera made out of a shipping container) on a tour from the East to the West coast. The result are 19 large impressive gelatin silver prints, beautiful black and white landscape photography in “wide screen display”. It is a real pity that there is not more information about all the individual prints anywhere to be found in the exhibition rooms. Next to that the pictures deserve better lighting, but all with all the prints are very unique and radiate that soft sense of voyeurism that pin hole camera photo’s tend to do. The museum also houses a large collection of movie and photo camera’s, kids will love the Polaroid Toy section for example. And speaking of kids: Eastman funded numerous schools, a hospital especially for dental care for unfortunate kids and gave away tens of thousands of camera’s to 12 year old’s in the USA and Canada to celebrate the 50th anniversary of the Kodak company. While visiting the museum you can leave your offspring at the inviting Discovery Room. Here young visitors can make their own prints and learn about film and photography. The George Eastman House is foremost worth visiting because of it’s significant role in the history of photography and film and it’s great collection. The fact that you can tour and visit the house itself and all the rooms Mr. Eastman lived in as well during your visit is an extra that few people can resist. The rooms are in perfect state and give a clear peek in an era (not so) long gone. Not near New York state at the moment? No problem. Just visit the Eastman House via Google’s art project. And yes, it’s the first photography museum to join the search engine’s programme. This entry was posted in Texts in English and tagged Article, George Eastman, Kodak, Museum, Philip Fokker, Photography on May 6, 2013 by phvf.